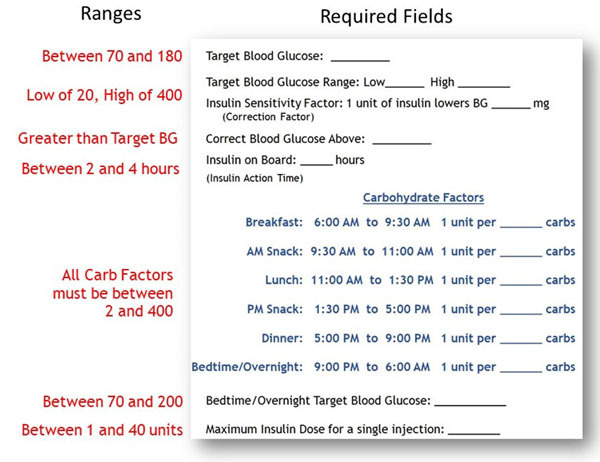 For families and school personnel needing to calculate insulin doses, we have an easier way – in 2 steps! » First, consult with your doctor to confirm your insulin dosing regimen. You can also print our sheet and bring it to your doctor. » Logon to your BlueLoop account, go to your Medical Profile tab to Turn On the calculator and enter the required insulin dosing fields. The calculator turns off after 90 days until you confirm your Medical Profile is up to date. Based on your last recorded insulin dose, we provide a reminder if there is insulin on board. The calculator is not intended for use with an insulin pump. » When creating a daily entry, the calculator will provide you the calculated amount, but you can also input an override amount if needed. » If you choose to input an override amount, we ask you to choose a reason why, by selecting one of our "jelly bean" icons. » Here's what the calculator looks like when used in the Mobile App.